Chicago Teachers Union members protest in front of the Board of Education. CHICAGO — Teachers may walk out of class May 1 as part of a one-day strike to protest the financial crisis engulfing the Chicago Public Schools, union officials said Wednesday. The Chicago Teachers Union House of Delegates agreed Wednesday evening to consider setting a vote for April 5 to decide whether to hold a walkout May 1. Any walkout would require a vote of the union's membership. "We are voting tonight to open the discussion period in our union, in which we talk about ways to respond to the crisis in CPS," CTU President Karen Lewis said before the delegates voted. Nearly a year ago, teachers went on a one-day strike on April 1, 2016 as negotiations with Chicago officials over a new contract faltered. A new deal was reached in October. Emily Bittner, a spokeswoman for the Chicago Public Schools, urged the union to stand with the district in its fight against Gov. Bruce Rauner. "We should all work to avoid students losing days of instruction and teachers losing days of pay," Bittner said in a statement. Bittner noted that the CTU's one-day strike in 2016 was ruled illegal by the Illinois State Labor Relations Board and said teachers who walk out of class would not be paid. Lewis said the large cancelation of school days and forced furlough days are "massive contract violations" that could force a strike. "At this point, these are cries of desperation. Hear our pleas," Lewis said. Chicago Public Schools face a $129 million budget deficit — created when Rauner vetoed a bill that would have helped the school district pay its pension bill. That shortfall threatens to force officials to end the school year on June 1 — 20 days early. Lewis blamed Rauner for the crisis. "Let us not forget he has not provided the state with a budget," Lewis said. "He can point his fingers to whoever he wants to, but its his responsibility to do this. It's his responsibility to put together a budget and it's his responsibility to figure out a way to fund schools equitably across the state." The possible strike date, May 1, is International Workers Day. It is "going to be a massive day of protests by immigrants, unionists and people who are part of a growing resistance in this country," Lewis said. Chicago school officials have sued the state, alleging that the way Illinois funds schools is discriminatory. The fiscal crisis for Chicago Public Schools began in November, when Rauner blamed Illinois Senate President John Cullerton for violating a compromise made in June that allowed schools to open last September. Part of that deal promised Chicago schools $215 million to help cover its pension obligation in return for statewide "pension reform," a long-held goal of the governor. But in a December message to legislators, Rauner said he would not sign a school-funding bill because it would amount to a "bailout" for CPS. The governor also wants lawmakers to adopt his agenda, which he says will spur business growth in Illinois, as part of a budget agreement. Cullerton denied breaking the agreement and said he was willing to continue working on pension reform with the governor. Rauner and Speaker of the House Michael Madigan have been locked in a bitter fight over the Illinois budget that has lasted nearly two years. In January, CPS Chief Executive Forrest Claypool ordered four unpaid furlough days for all CPS employees to save $35 million. The union has objected to that move, officials said. The next scheduled furlough day for teachers is April 7 and Lewis wants it "off the table." "That would show us some seriousness about them really trying to work with us," she said. In February, Claypool cut $5 million by canceling professional development events for its central office staff and slashed charter school budgets by $15 million by the end of the year, officials said. Claypool cut another $31 million by freezing a portion of schools' discretionary funds, which can be used to purchase textbooks and technology as well as to pay for after-school programs, field trips and hourly staff. 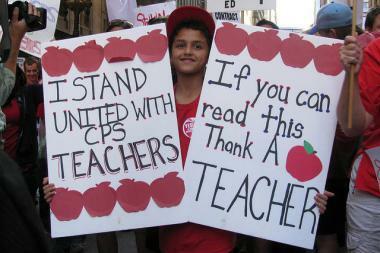 Those cuts leave a CPS deficit of $129 million, officials said. "Some people will say if you strike, won't you be losing another day of pay?" Lewis said. "But I say if we don't fight back, if we stay at home when they threatened us with furloughs and schools closures, if we cower under the covers then we're never going to stop these fights."